Beauty in a flower garden comes from the contrasts created between the color, shape, and size of the collected plants’ leaves; color of bloom is of secondary importance. 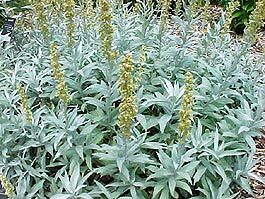 With that in mind, one must grow Artemisia, for no other perennial loads the pallet with electrifying, silvery white to bluish gray foliage in so many different forms. A. ludoviciana ‘Valerie Finnis’ (silver sage) features wider silvery leaves than older varieties and attains a bushy, oval form up to 30” tall. One of the great all-time, “What is THAT? !” plants of the sunny rock garden is A. schmidtiana ‘Silver Mound,’ a soft, dense, low-mounding carpet of silvery gray foliage. It grows best neglected in cruddy, average soils. Plant pretty Platycodon (balloon flower) and you’ll marvel at the graceful, cool elegance it maintains through an entire season of blistering sun. Bloom habit is unique—what begins as a puffed-out, five-sided box pops open to create a cupped, two-inch, star-shaped flower. Common P. grandiflorus bears deep blue blooms and remains in my mind more striking than the new, “improved” cultivar, ‘Double Blue.’ ‘Albus’ has bright white flowers; ‘Shell Pink’ blooms pale pink. Plants flower profusely in midsummer. Key to balloon flowers’ beauty is that the elegant blooms emerge from very narrow, erect vertical stems sheathed in tidy, lustrous green leaves that maintain their chic all season. This confuses even me, but I’ve always looked at Balloon Flower in bloom and been reminded of Audrey Hepburn as Holly Golightly in Breakfast at Tifanny’s. There, I’ve said it. Now you know how strange the workings of a gardening addict’s mind. Americans invented jazz, the one form of music credited as being our own (the blues, apparently, came from Norway). Americans were also the first to mix tall grasses into the flower garden, or, at the very least, we beat the English to it by about 500 years. The wonderful look this relatively new planting trend imposes on our gardens is based on form and foliage. 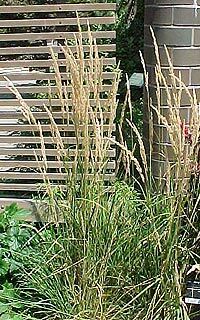 Calamagrostis (reed grass) is a sensational group of sun-loving grasses. C. x acutiflora ‘Karl Foerster’ soars upward five to six feet with an arching habit and bronze-colored, feathery flower heads that appear in early summer. C. x acutiflora ‘Avalanche’ is a new variety that tops out at five feet with much the same form and bloom habit except the variegated foliage features a striking white stripe running up the middle. While numerous perennials assigned to the full sun category will often sneak by in conditions affording a few hours less, Achillea (yarrow) accepts no luminary compromise. Bountiful flat clusters of dense, tiny flowers appear only if the plant is grown in true full sun. Varieties feature a broad, bushy form and range in height from twenty-four to forty-eight inches, but in even the lightest shade, yarrow topples quicker than a relative at an open bar. Bloom colors are white, yellow, gold, pink, red, and lavender, the flower clusters floating above marvelous, lace-like foliage that remains attractive all season. ‘Coronation Gold’ is a stout three-footer good for drying. Yarrows sold under the trade name Galaxy Series include a wide range of heights and colors and are sturdy, durable perennials. CM: So what exactly is the definition of full sun? RG: The standard definition—six or more hours of direct sunlight per day—is a good starting point, but realize that a tree or garden receiving three hours of direct sun first thing in the morning and three more hours late in the day is not in full sun. “Full sun” needs to include the four hours when the sun is up high and blasting straight down on the plants, from 10:30 a.m. to 2:30 p.m., or thereabouts. Assuming two or three hours of direct sunlight before or after those times, you can grow nearly everything that needs full sun. But nothing beats sunshine from 9:00 a.m. to 3:00 p.m. There are many essential perennials that require that much sun, or else bloom may be reduced, or they’ll flop over. CM: So without a solid, six-hour, midday stretch of direct sunlight, growing plants that need full sun can be risky? RG: It isn’t risky, it’s called gardening. Know your yard. Describe to the person at the nursery the times an area of your yard is in sun, then ask if the perennial, tree, or shrub you want will do well in that situation. If the person doesn’t know, get a better nursery. You want to be darn sure before you plant a $280 tree, but plenty of perennials listed as “full sun” bloom and look fine in something less than that. The plants don’t read the books. You learn what they need. CM: Is it best to use a sprinkler or soaker hoses or some form of irrigation in full sun situations, to ensure ample moisture? RG: You never use a lawn sprinkler to water a garden or shrubs because the leaves get drenched and that leads to fungal disease. But a good drip/soaker hose system works beautifully and saves time. Just be sure it’s designed for the perennial bed, or shrub border, or tree planting. These things require different amounts of water on different schedules, and should each be on their own system. Then remember that more people kill plants from overwatering with an irrigation system than any other way. CM: So many perennials are described as preferring “well-drained soil rich in organic matter.” Does that stuff exist? RG: The Morningside neighborhood in Edina has it; that’s the only area I’ve done landscaping where I didn’t need to amend the soil. Most often you need to create good garden soil. Nearly all city and suburban soils lack organic matter. So you add it, a good three-inch layer of compost, peat moss, composted manure, or all three. Till it in with a power tiller, the deeper the better. Add a little coarse sand to aid drainage, unless you have clay. For clay soils, add only organic matter, double the amount above.